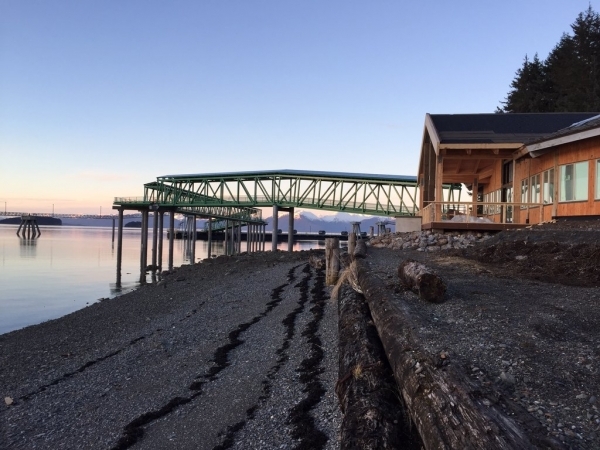 Icy Strait Point in Alaska has announced that its new dock for cruise ships has been 99 percent completed, so for the first time this May, ships will come alongside a floating dock, Adventure Center and Duck Point Smokehouse restaurant. Icy Strait Point is an Alaska Native-owned cruise destination set on Chichagof Island near Hoonah, Alaska. Constructed in partnership with the City of Hoonah, the 400-foot floating dock will be finished well in advance of the first call on May 11, according to Icy Strait Point. It was built to accommodate the next generation of larger ships anticipated to call on the Alaska market in the coming years. The 7,000-square-foot Adventure Center is located in front of the dock’s covered trestle. This wood-beam, Tlingit-style building will serve as a welcome center, departure lounge and tour booking center for shore excursions, including whale watching, bear viewing and a ZipRider. This year, Celebrity, Royal Caribbean, Norwegian, Oceania, Regent Seven Seas, Holland America, Princess and Crystal will make 78 calls on Icy Strait Point between May and September, expected to bring nearly 160,000 passengers over the course of the season. Icy Strait Point is located approximately 35 miles west of Juneau and 25 miles south of Glacier Bay National Park.